DJMREX will be the opening act for Skinny Puppy’s Live Shapes For Arms Tour in 2014. DJMREX supports the first eight shows starting in Santa Ana on January 24th, 2014. Don’t miss the chance to see both Cyrusrex and Douglas J. McCarthy as DJMREX and the legendary Skinny Puppy on one Stage! 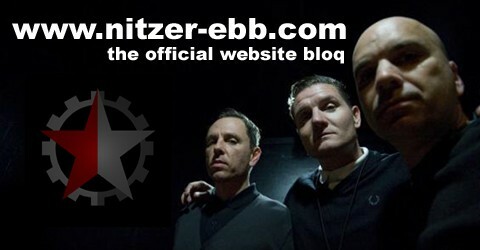 Join the DJMREX official website for all dates. Douglas have an DJ Gig coming up with an Special Old School EBM Set at the History of Industrial Night feat. Douglas McCarthy (Nitzer Ebb) & Krisz Klink (Kontrol Faktory) at Das Bunker on Friday, December 13th, 2013! Headman feat. Scott Fraser & Douglas McCarthy making NOISE! Swiss label Relish Recordings presents the new single from Headman featuring Scott Fraser and Douglas McCarthy giving a taster of his artist album due later in the year! Robi Insinna aka Headman has a long history in electronic music and most often trades in the sounds of raw, machine driven funk. Here he pairs up with former Relish producer Scott Fraser of the so-called Scrutton Street Axis (along with likeminded tunesmiths Andrew Weatherall and Timothy J Fairplay who all work in the same basement studio) and Nitzer Ebb’s Douglas McCarthy who provides vocals. The idea behind the new material is for Robi to work with artists he likes and simply to see what happens. A promo video will be online tomorrow (2013-06-21) on vimeo! Check it out!on vimeo! Check it out! Last year Fred Perry compiled a list of its 60 most loyal and distinguished fans with a view to requesting their participation in a charity fund raising exercise. Designers, musicians and sports people were sent a reproduction of the original 1952 Fred Perry shirt and asked to personalise the shirt with a birthday message or full-blown customisation. Pre-Order your Copy of the Basic Pain Procedure CD now at the Pylon Records online store! There expects you a very special offer as well: a limited edition cassette of the BPP! The cassette will contain everything that is on the CD release plus a 4 Gig, Credit Card styled USB, which is housed in the cassette tape. This USB will contain everything on the CD, plus a previously unreleased live concert from the same era. In addition the NovaFuture Blog is presenting a Contest with Pylon Records again to win the CD Basic Pain Procedure. Join the blog to get your chance to win! Good luck!